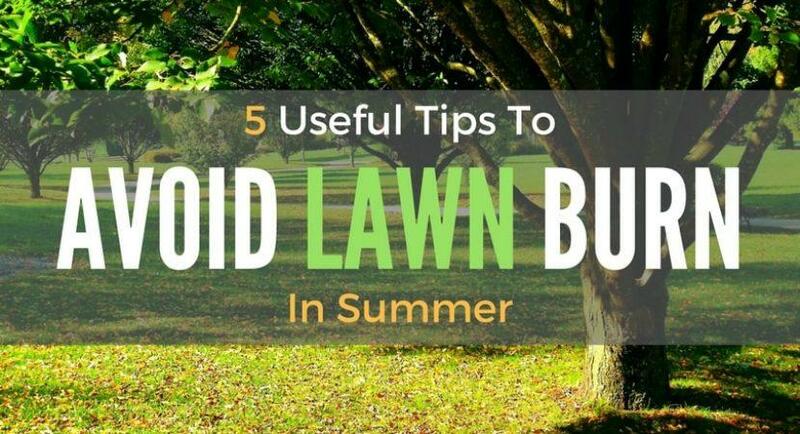 5 Useful Tips To Avoid Lawn Burn In Summer: You Should Know! Summer is the time of extremely hot weather, which can dry out almost all of life including your lawn. Although you have watered, mowed or fertilized your lawn as properly as you think, you may notice some brown spots or even large burnt-out areas on your lawn. It is likely that the lawn burn is caused by the drought. But in case you water your lawn very frequently and thoroughly, and the brown spots still appear, you should think about other causes. There are some reasons leading to the lawn burn. In this article, we would like to point out these reasons, as well as the prevention methods to save your lawn from burning. There is no doubt that water is vital for grass growth, especially in summer when the sun keeps spreading heat and causes the grass to dry out quickly. However, even though you have watered your lawn very often, it still gets burnt somewhere. Are you watering correctly? The key of proper watering is not the frequency but the quality of each time you water. It is advisable to water the lawn deeply (a couple of times per week) rather than lightly and frequently. The reason is your lawn can absorb the water better with deep watering because more water can penetrate into the soil and reach the grass root. In this way, the grass root can grow more strongly and deeply. In contrast, when you water the lawn lightly during the summer, the water can rapidly run off the soil or only penetrate a thin layer of turf surface. In this case, grass roost will spread close to the soil surface where it is very vulnerable to the heat and drought. It is common to water about 1 to 1.5 inch weekly. You can measure the amount of required water using a tuna can as measurement. Watering is encouraged in the early morning because the water will not evaporate quickly and the lawn will have time to dry before night time, when fungus prospers. 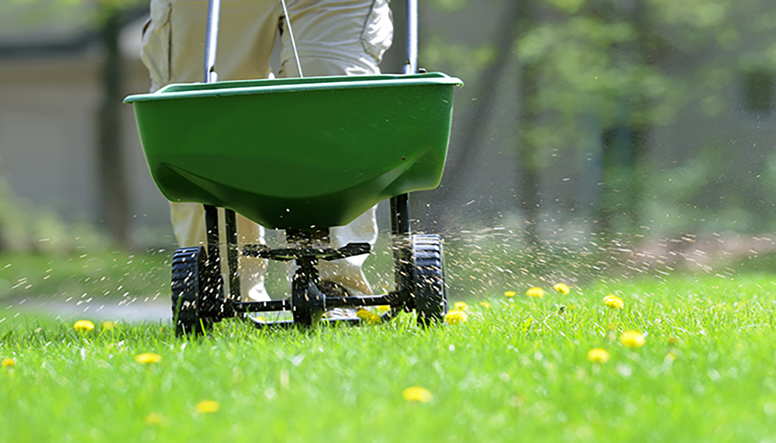 Fertilizers stimulate grass growth, but over fertilizing can be one cause of your burnt lawn. Chemical fertilizers are fast-release types, which feed the grass with so much nitrogen that the microbes in the soil can hardly digest it all. As a result, the grass will dry out quickly. If possible, please use organic fertilizers to fertilize the soil as they are slow-release and can save your lawn from burning. It is a wise choice to have a spreader to evenly distribute the fertilizers over the lawn. Any parts of the lawn, that get fertilized too much, will result in growing too fast. The green tender buds will have a hard time to grow with the heat of summer, and they are easy to be burned. Therefore, a spreader will be effective in nourishing the lawn equally. You can not only prevent the lawn from burning if over fertilized, but also save the environment and your budget because only an adequate amount of fertilizers are applied. To keep the nice look of your lawn, you may need to mow it several times, but inconsiderate mowing may harm your lawn. 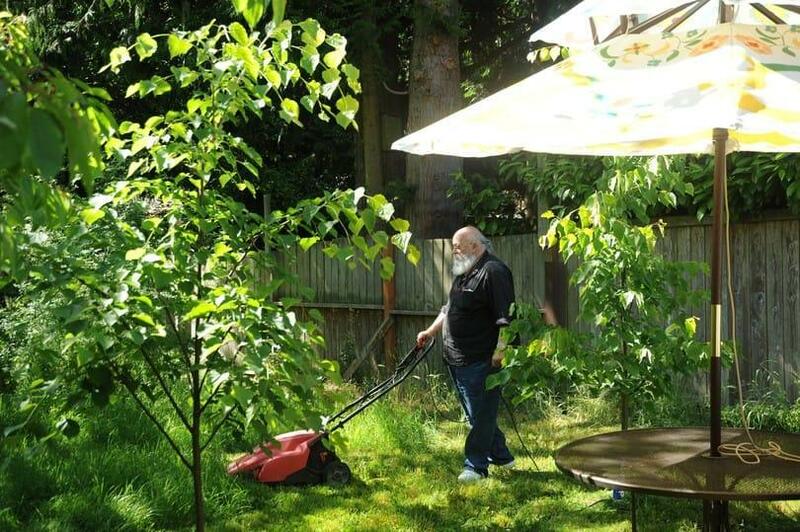 Please remember: do not mow the grass too low because you may unconsciously cut off the green part, which plays an important role in generating nutrients through photosynthesis. Moreover, low grass makes the root exposed to the sun. Consequently, the lawn will dry out faster in the summer. The rule of thumb is not to mow more than one third the length of the grass. Make sure your mower blade is sharp enough for mowing. A blunt blade only tears off the grass, causing an ugly look and more a favorable condition for disease. You may have to mow frequently as the grass grows up quickly. But in return, your lawn will always look green and neat. It is also a good idea to mulch the grass clippings so that the soil can be kept moist adequately. Summer may condition the spread of diseases such as powdery mildew and brown patches. Those are fungus related, so fungicide is necessary if they get out of control. 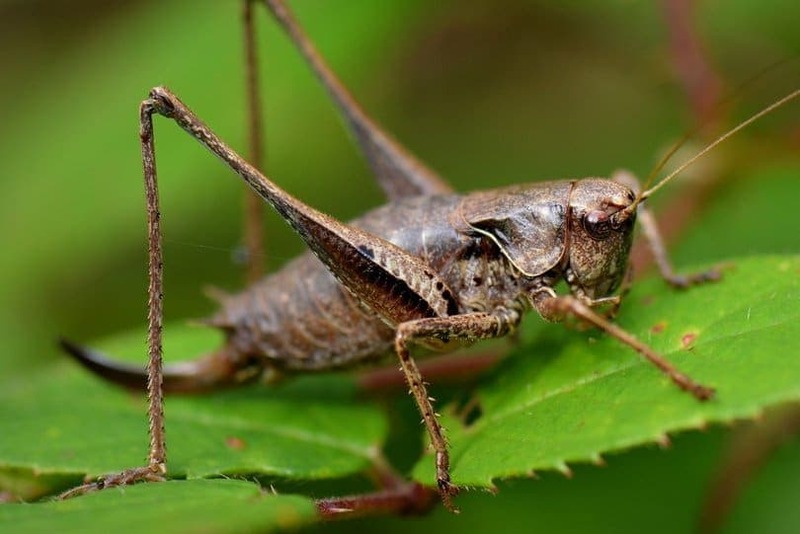 Besides that, in case of severe insect infestations or weed outgrowth, you may need to resort to some kind of pesticides or herbicides to save your lawn. You can mix these chemicals with fertilizers or water, while fertilizing or watering. But, please make sure you apply a sufficient amount of them because the excess of these chemicals may cause lawn burn. Don’t spread the chemicals in summer days with the temperature higher than 85◦F or 29.4◦C because the grass has already been exhausted due to the heat, and it is very vulnerable. 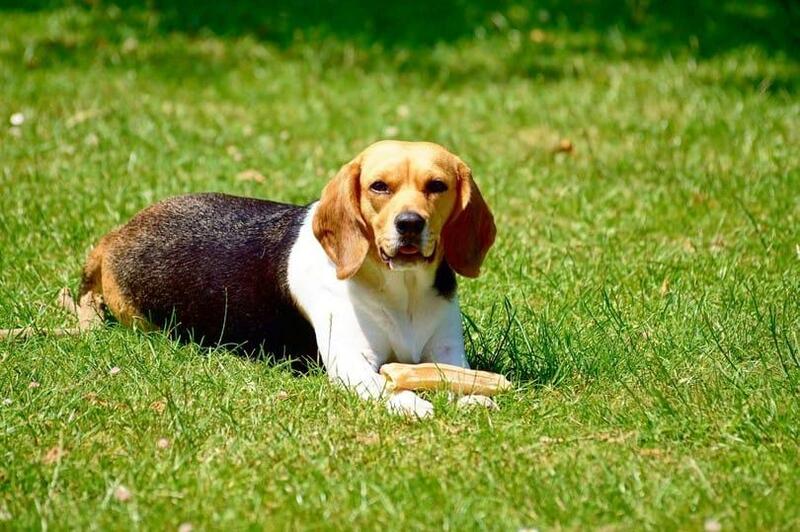 It may sound amazing, but it is really true that your lawn can be burned because of pet urine. Nitrogen in the urine is same as in fertilizers. Excessive amount of pet urine in the grass can create a burned spot. This often happens in small areas, so you can water these areas to dilute the nitrogen. If the burn is only around the upper layer and has not reached the root yet, the grass will soon recover and grow green again. If the root is damaged, you should use a rake to remove the spoiled parts. Feed your dog with low protein foods, so that the nitrogen concentration is lower in its urine. It is not a big deal, but you still need to care for it to ensure a nice looking lawn. The green look of your lawn may help to cool down the heat of summer, but it requires proper care and attention. So, you should spend time watching over your lawn to find out the brown spots and fix them, as well as apply some tips above to prevent your lawn from burning. It is not too hard to avoid lawn burn as long as you perform watering, fertilizing, mowing or disease controlling, in the right way. Pay attention to care your lawn well, and you can keep it always green in summer.